James Wallace continues the Zombie Theorem series with book five! James Wallace continues to jump between genres. His latest ballet move brings to life a modern detective with all of the big city blues. Lieutenant Dan Welko of Seattle PD is a no-nonsense, highly respected detective. He brings his own kind of justice to his city and it works well. He has the drug gangs and organized crime following his rules, if they want to do business. Till a new team of serial killers come to town testing Dan and his resources. One an apprentice, the other the mentor who believes they are the next Ripper. With his two oldest friends at his side he must survive attacks at every turn all while having the woman of his dreams tear all his walls down. James Wallace has lost his mind. He jumped from zombie fiction to space opera...and his fans like it! Mars’ (D-SEA) Deep Space Exploration ship, Tranquility, has been dispatched to an anomaly detected in a far-off star system. Awakened early by the ships Artificial Intelligence, Captain Dan Welko and his crew face danger at every step of their mission, including first contact. Meanwhile back home, war brews between the One World Religion of Earth's (TFA) Terran Forces Army and Mars’ free people. 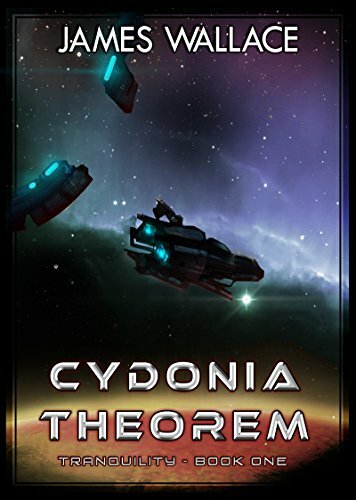 It is up to Admiral Meredith Welko, her team of warriors Aces and Zephyr, along with her smaller fleet of warships of the (MDF) Mars Defense Forces, to protect her people. Conspiracy, war, deep space exploration, and the essence of creation are explored. James Wallace keeps writing killer books! 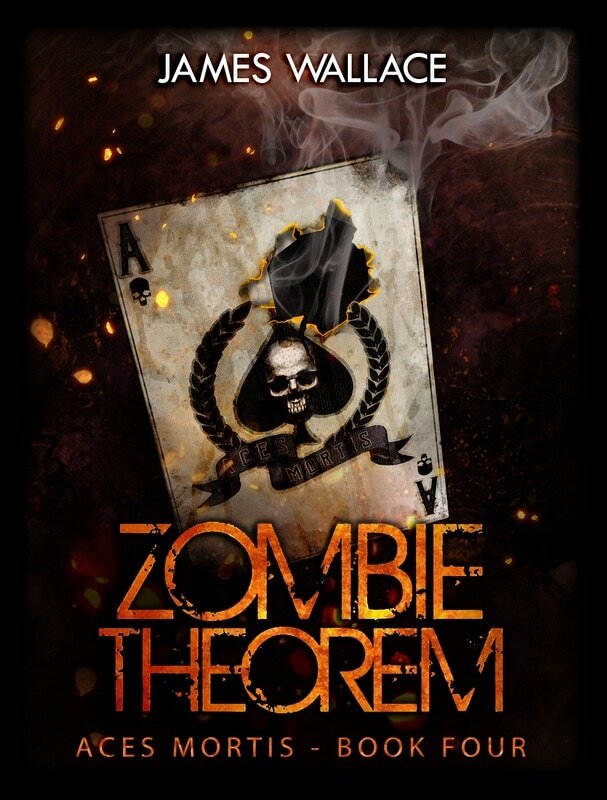 "Zombie Theorem" has another addition to the Malleus Publishing Stable. 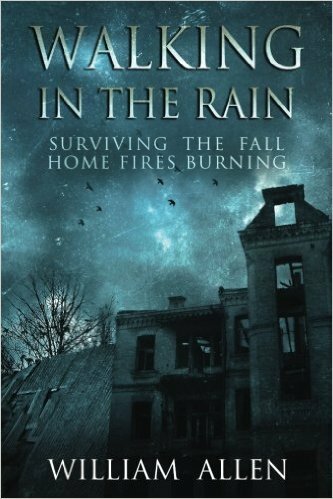 William Allen has the first two books in the "Walking in the Rain" series available in one paperback edition. "Surviving the Fall" and "Home Fires Burning" should be read together. Order your copy from Amazon and own a piece of Luke and Amy's exciting story of survival after the CME rocks our civilization to the core. William Allen, M.C. Allen, and James Wallace came together and decided to start a small independent publishing group. Our goal is to assist each other and others in promoting the rich and diverse culture of indie writing. Our small size allows us the flexibility and freedom to pick and choose various writing genres to explore in a much quicker pace than a larger organization. In the coming months William Allen and James Wallace have works in their two different series coming out. 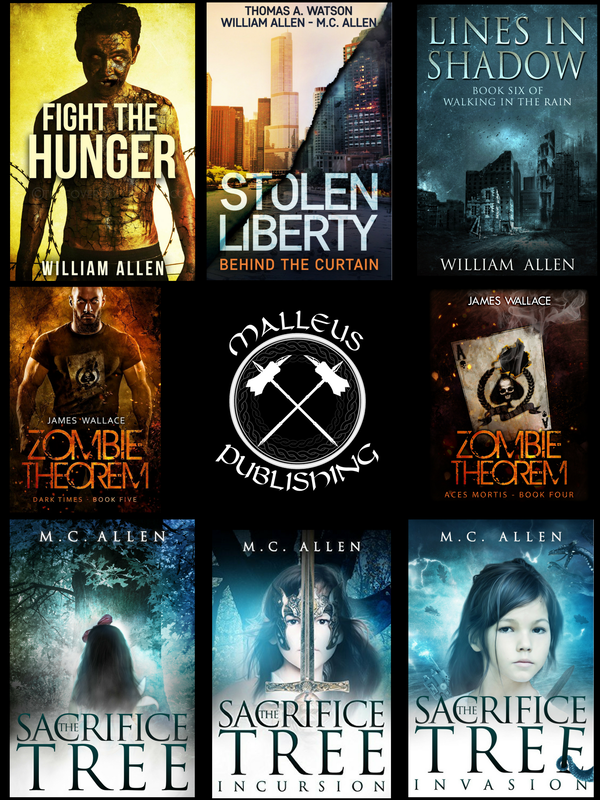 Malleus specializes in post-apocalyptic thrillers, science fiction/fantasy, and a few odd zombies for good measure. James Wallace has indicated a desire to explore writing a western for fun, while M.C. Allen is formulating a dystopian future with a societal collapse near the end of the year. If you would like to be included in updates or sneak peeks of works in progress, leave your information below. We promise not to sell you sunglasses or flood your e-mail with spam.